“This Ontario election has shown more than most elections that our First-past-the-post voting system is broken,” says Réal Lavergne, President of Fair Vote Canada. Until the very last minute, everything hinged on whether the vote would swing ever so slightly in favour of one party or the other. Swing one way, and we would have a majority Conservative government ready to undo the policies of the past government. Swing the other way, and we could end up with an NDP majority government. In either case, we might end up with a one-party majority government which 60% of the population did not want. In either case, a large share of the voting population found itself needing to vote strategically, not to elect the candidate of their choice, but to prevent another party from forming a false majority government. Whoever said that voting under our first-past-the-post system was easy? It’s not, as it requires a crystal ball, otherwise known as “the polls” before deciding how to vote. Granted that voters wanted change, but what of the 19.5% of voters whose first choice remained the Liberal Party? As always under First-past-the-post, the party running third gets shafted, and Liberal voters failed to secure the representation they voted for, electing representatives to only 6% of the available seats. Many projections showed that even if the NDP had won 1 per cent more votes than the PCs, or 2 percent, or even 3 per cent, the PCs were likely to win a majority of seats, a “wrong-winner election” like Donald Trump, and also like 2006 in New Brunswick, 1998 in Quebec, and 19 other elections in Canada’s sad experience with winner-take-all elections. The PCs increased their share of the popular vote by only 9% over what they won in the 2014 election, but that was enough to hoist their seat count from 28 seats to 76 seats when so many of the votes of the 60% who voted against Doug Ford did not count. “That’s the way our system works, or more accurately, this is how our system does NOT work, to elect a government that reflects the views of the majority. How are voters supposed to hold the government accountable when it answers to only 40% of the voters?” says Lavergne. “We’ve seen a lot of negative campaigning in this election, driven by the logic of the voting system,” says Anita Nickerson, FVC’s acting executive director. “Candidates and parties were attacking other parties as much as they were trying to put their own vision forward. This too is a well-known feature our our winner-take-all system. When there can be only one winner, the best strategy is to attack all of your opponents equally and mercilessly. Ontarians deserve a voting system designed to make every vote count. In Ontario elections generally, about 50% of voters cast ballots which elected no one. Based on results available now, 52% of voters cast ballots which elected no-one. 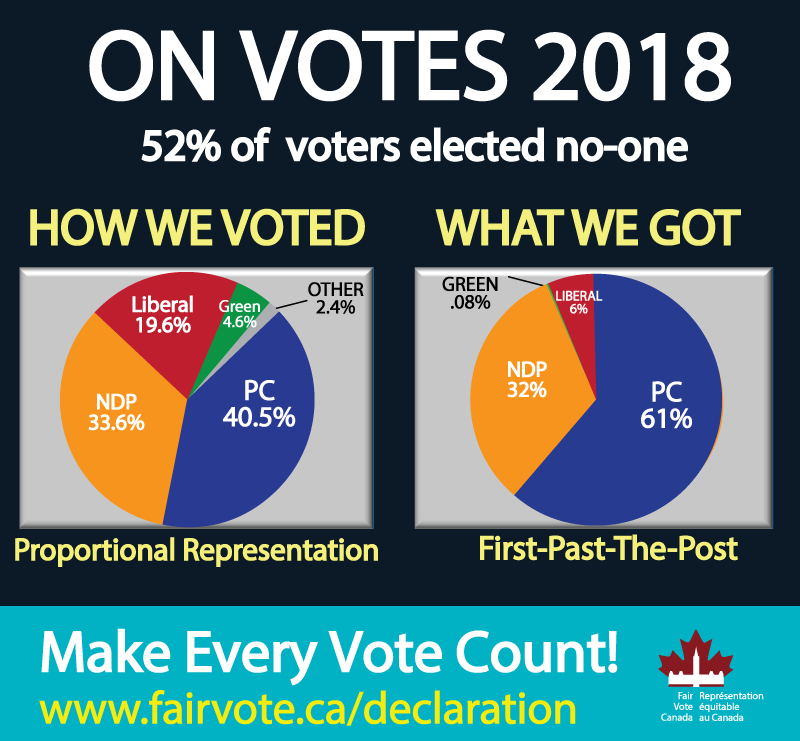 Fair Vote Canada is a grassroots organization representing over 70,000 Canadians calling for equal and effective votes for all citizens through the use of proportional representation. Liberals cast 19.6% of the votes, deserved to elect 25 MPPs, but elected only 7. PCs cast 40.5% of the votes, deserved to elect 51 MPPs, but elected 76. New Democrats cast 33.6% of the votes, deserved to elect 42 MPPs, but elected 40. Greens cast 4.6% of the votes, deserved to elect 6 MPPs, but elected only 1.